A true upgrader with the incomparable Trakehner charm and imposing, dance-like motions and wonderful suppleness. In 1999, Latimer absolved an excellent stallion performance test in Adelheidsdorf. He won third place with a total of 132 points and with more than 20 points lead, was the absolute rideability winner with a score of 152 points. 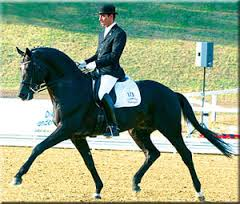 In 2000, he won both the Trakehner Championship, as well as the Federal Championship in sovereign style. Latimer moreover won the federal championship of 4-year old stallions in Warendorf with a never previously attained total score, being awarded the dream score of 10.0 for type and rideability. Height: 168 cm / 16.2 h.h.